"If Easter egg decorating is becoming more of a chore than a fun holiday treat, there's one way to make the ritual more rewarding. In 20 minutes or less, Joan Bittner at Hamtramck's Polish Art Center can sell you on an old tradition: The Ukrainians call it Pysanky, the Polish call it Pisanki. Either way you say it, it's an art form that can be quite elaborate or quite simple. It's all about wax, which resists layers of dyes, trapping colorful designs that are revealed when the wax is finally melted away. Pysanky started as a pagan ritual. 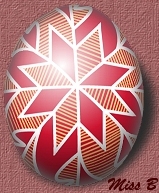 Eggs were decorated as gifts and, decorated with the right designs, were thought to end diseases, bless marriages, prevent storms or trap evil spirits. The meaning and symbols changed as Christianity was adopted." This short quote appears in an article that was published in the Detroit News in April 2001. 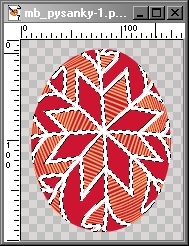 Now I'm going to try and show you how to reproduce one of the traditional Pysanky Egg designs with Paint Shop Pro. This tutorial was created and posted to this web site on March 4, 2002 and is Copyright © 2002-2004 by Miss B's Graphics, all rights reserved, and is my own original design and not meant to copy or duplicate the efforts of any other PSP tut writer. Therefore, you may not download this tutorial and place it on any other web site, CD collection, or graphics group. If you wish to link to this tutorial from your graphics forum for use as a learning tool, I only ask that you first ask for permission via my Contact page (see Menu link above). VM Natural, which you can download at Les Filtres. The site is written in French, so just click on the zip file icon. Eye Candy 3.0, which you can download freely at Planet Photoshop. After you download my selections and the third-party filters you'll need, install the filters and unzip the mbg-pysanky.zip files into your PSP/Selections folder. If you don't have one, just create one and you're all set. OK . . . Let's get started!! Open a new image, 350 x 435, 72 ppi resolution, transparent background and 16.7 million colors image type. Rename Layer 1 as Background Image and hide it by clicking on the small *glasses* icon to the right of the layer name. 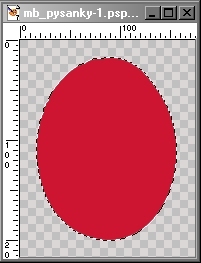 Add a new Raster Layer and rename it Solid Red. 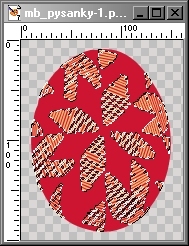 Making sure that the Solid Red layer is active (it should be highlighted in the Layer Palette), load the mbg-pysankyegg.sel file (Selections > Load From Disk), and fill with the background color of your choice. I used #cd1531. NOTE: As mentioned above in the quote from the Detroit News, each is a traditional design using specific colors that have a specific meaning. Of course, for this tutorial, you can get as creative as you wish with the colors you use. Just try to make them a pleasing combination. For the most part, the main outlines of this particular design should probably remain white. Deselect (Ctrl + D) and add another new layer, renaming it Yellow Stripes. 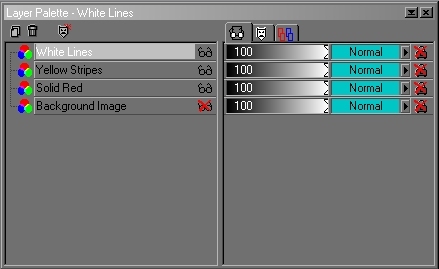 Making sure that the Yellow Stripes layer is active (again, it should be highlighted in the Layer Palette), load the mbg-yellowstripes.sel file (Selections > Load From Disk), and fill with the stripe color of your choice. I used #ffbd6f. You will probably have to zoom in at least 2 to 3 times to make sure that you are filling all of the stripe selections. Some will fill as a group and some won't, depending on how close to each other they are, and you want to be sure you fill all of them. Deselect (Ctrl + D) and add another new layer, renaming it White Outlines. Making sure that the White Outlines layer is active (again, it should be highlighted in the Layer Palette), load the mbg-whtlines.sel file (Selections > Load From Disk), and fill with white (#fff). Make sure that your Background Image layer is still hidden (you should see an X through the little glasses to the right of the layer name in the Layer Palette), and ALSO making sure that you have one of the other layers active (highlighted) in the Layer Palette, merge all the visible layers (Layers > Merge > Merge Visible). With your Merged layer active, choose your Selection tool (Rectangle, antialias and feather both UNCHECKED), and draw a rectangle shape around your egg, and then carefully click once anywhere on your egg to select it. Now on to Page 2 to add the finishing touches to your egg.